Edward FAREY [Parents]-9202 was born 1 on 23 May 1701 in Flitwick, Bedfordshire, England, United Kingdom. He died 2 on 4 Dec 1751 in Flitwick, Bedfordshire, England, United Kingdom. Edward married (MRIN:4021) Ruth COOK-9203 on 16 Jan 1729 in Northchurch, Hertfordshire, England, United Kingdom. Edward had a will 3 on 10 Nov 1751 in Flitwick, Bedfordshire, England, United Kingdom. Dated 10 Nov 1751, not 1752. Edward Farey is from Flitwick, Bedford. He gives all of his lands, cottages, messuages, etc. to his wife Ruth unless she marries or dies, then it all goes to his son Edward Farey. If son Edward dies before he marries or has issue then it all goes to Robert Cook, John Cook, Michael Cook, Susanna Wright Brothers and the sister of the said Ruth, his wife. He does not say who these people are. Witnesses: Robert Hardwick, Elizabeth Russett, and William Padder. Proved 7 April 1755 before John Taylor. Ruth COOK 1-9203 was born about 1703 in of Flitwick, Bedfordshire, England, United Kingdom. Ruth married (MRIN:4021) Edward FAREY-9202 on 16 Jan 1729 in Northchurch, Hertfordshire, England, United Kingdom. M i Edward FAREY-9204 was born about 1736. He died before 30 Sep 1808. Edward FAREY [Parents] 1-9204 was born about 1736 in Flitwick, Bedfordshire, England, United Kingdom. He died before 30 Sep 1808. Edward married 2 (MRIN:4022) Anne HOWSON OR HODSON-9205 on 22 Jun 1756 in Flitwick, Bedfordshire, England, United Kingdom. Edward's will was probated 3 on 30 Sep 1808 in Flitwick, Bedfordshire, England, United Kingdom. Edward Farey the elder is a yeoman from Flitwick, Bedford. He has a son named Edward Farey. He has lands, messuages, cottages, etc. in Flitwick. He makes his son Edward his Executor. Witnesses: E Eagles, William Farrer, and Edward Hanson or Horson, both of Flitwick. Anne HOWSON OR HODSON-9205 was born about 1738 in of Flitwick, Bedfordshire, England, United Kingdom. Anne married 1 (MRIN:4022) Edward FAREY-9204 on 22 Jun 1756 in Flitwick, Bedfordshire, England, United Kingdom. Anne FAIREY-9206 was born 1 on 25 Apr 1757 in Flitwick, Bedfordshire, England, United Kingdom. Ruth FAIREY (twin)-9207 was born 1 on 12 Oct 1759 in Flitwick, Bedfordshire, England, United Kingdom. Edward FAIREY (twin)-9208 was born 1 on 12 Oct 1759 in Flitwick, Bedfordshire, England, United Kingdom. He died after 18 Jun 1824 in Flitwick, Bedfordshire, England, United Kingdom. Edward had a will 2 on 18 Jun 1824 in Flitwick, Bedfordshire, England, United Kingdom. Edward Farey is from Flitwick, Bedford. He is a yeoman. He gives his lands, messuages, tenements, cottages, etc. in Flitwick to Robert Adams, son of William Adams of Flitwick, labourer. He does not say who they are. If Robert Adams dies before 21 then Edward gives all the lands, etc. to James and Joseph Adams, brothers of Robert Adams. He gives100 pounds to Thomas Hobbs, son of Henry Hobbs, of Flitwick, shoemaker. He does not say who they are. He gives 50 pounds to Martha Hobbs, sister of Thomas Hobbs. He gives 30 pounds to Andrew Potter of Flitwick, yeoman. Edward mentions that he presently resides with this Andrew Potter. He gives to his respected friend Peter Kempson of Ruxoxe, John Abbott, the younger of Ruxox, and Richard Brinkler of Flitwick. Witnesses: John Eagles of Ampthill, Robert Furze or Fwize, and Robert Caulcut of Flitwick. His personal estate did not amount to 15 hundred pounds. John FAIREY-9209 was born 1 on 25 Mar 1763 in Flitwick, Bedfordshire, England, United Kingdom. Martha FAIREY-9210 was born 1 on 8 May 1767 in Flitwick, Bedfordshire, England, United Kingdom. George POYNER-9216. George married 1 (MRIN:4023) Anne FARIE (twin)-9212 on 19 Nov 1677 in Marston Moretaine, Bedfordshire, England, United Kingdom. Anne FARIE (twin) [Parents]-9212 was born 1 on 15 Dec 1658 in Toddington, Bedfordshire, England, United Kingdom. Anne married 2 (MRIN:4023) George POYNER-9216 on 19 Nov 1677 in Marston Moretaine, Bedfordshire, England, United Kingdom. Title Copy of conveyance by James Bisse of Cadicott Berry in the county of Hertford, doctor of physic, and Anne his wife, daughter and heir of George Pogner, late of the same, and Anne his wife, daughter of William Fayrie and niece of Henry Francklin, late of Littlington in the county of Bedford, yeoman, to William Hannell of Littlington, gentleman, of premises called Fryers in Battlesden End in the parish of Littlington, and also of premises in Wroxhill in the parish of Marston Mortaine. Calvin BOWMAN-14271 was born in 1826 in Pennsylvania, United States. He died 1 on 16 Feb 1912 in Philadelphia, Philadelphia, Pennsylvania, United States. Calvin married 2 (MRIN:4024) Mary PARK-9221 on 14 Nov 1898 in Tunkhannock, Wyoming, Pennsylvania, United States. Calvin was counted in a census 3 in 1900 in Orleans, Harlan, Nebraska, United States. Mary PARK [scrapbook]-9221 was born 1, 2 on 17 Jun 1823 in Luzerne, Pennsylvania, United States. She died 3, 4 on 16 Feb 1912 in Wyoming, Pennsylvania, United States. Mary married 5 (MRIN:4024) Calvin BOWMAN-14271 on 14 Nov 1898 in Tunkhannock, Wyoming, Pennsylvania, United States. Mary was counted in a census 6 in 1850 in Pennsylvania, United States. She was counted in a census 7 in 1880 in Forkston, Wyoming, Pennsylvania, United States. She was counted in a census 8 in 1900 in Orleans, Harlan, Nebraska, United States. CENSUS: Living with daughter and son- in-law, Edwin De Wolf and Amelia De Wolf. Edwin A. DE WOLF-14270 was born 1, 2 on 30 Mar 1840 in Windham Township, Luzerne, Pennsylvania, United States. He died 3, 4 on 7 May 1915 in Wyoming, Luzerne, Pennsylvania, United States from of paralysis. He was buried 5 on 10 May 1915 in Wyoming, Luzerne, Pennsylvania, United States. Edwin married (MRIN:4025) Amelia FARR-9222 in 1869 in Luzerne, Pennsylvania, United States. Edwin resided 6 in 1880 in Forkston, Wyoming, Pennsylvania, United States. He served in the 52nd Pennsylvania Volunteers during the Civil War. He was living in 1902. Amelia FARR [Parents]-9222 was born 1 in Oct 1841 in Pennsylvania, United States. She died 2 on 28 Jul 1903 in Wyoming, Luzerne, Pennsylvania, United States. She was buried 3 in 1903 in Wyoming, Luzerne, Pennsylvania, United States. Amelia married (MRIN:4025) Edwin A. DE WOLF-14270 in 1869 in Luzerne, Pennsylvania, United States. Amelia was also known as Adelia Farr. She was counted in a census 4 in 1850 in Forkston, Wyoming, Pennsylvania, United States. She resided 5 in 1880 in Forkston, Wyoming, Pennsylvania, United States. She resided 6 in 1900 in Wyoming, Luzerne, Pennsylvania, United States. Orlando Benjamin FARR [Parents] [scrapbook]-9223 was born 1 on 11 Mar 1846 in Forkston, Wyoming, Pennsylvania, United States. He died 2 on 14 Jul 1909 in Monroeton, Bradford, Pennsylvania, United States. Orlando married (MRIN:4026) Elizabeth E. ALLEN-9438 in 1876 in North Branch, Wyoming, Pennsylvania, United States. Orlando was also known as Orlander Farr. He was counted in a census 3 in 1850 in Forkston, Wyoming, Pennsylvania, United States. Elizabeth E. ALLEN-9438 was born on 18 May 1848 in Lovelton, Wyoming, Pennsylvania, United States. She died on 10 Mar 1935 in Hartford, Windsor, Vermont, United States. Elizabeth married (MRIN:4026) Orlando Benjamin FARR-9223 in 1876 in North Branch, Wyoming, Pennsylvania, United States. M i Stephen Vancola FARR-9439 was born on 24 Nov 1879. He died in 1942. M ii Lamont William FARR-9440 was born on 13 Nov 1881. Orlando Benjamin FARR [Parents] [scrapbook]-9223 was born 1 on 11 Mar 1846 in Forkston, Wyoming, Pennsylvania, United States. He died 2 on 14 Jul 1909 in Monroeton, Bradford, Pennsylvania, United States. Orlando married (MRIN:4027) Cornelia C. ALLEN-14300 on 25 Dec 1867 in Wyoming, Pennsylvania, United States. Cornelia C. ALLEN-14300 was born in 1850 in Pennsylvania, United States. Cornelia married (MRIN:4027) Orlando Benjamin FARR-9223 on 25 Dec 1867 in Wyoming, Pennsylvania, United States. May FARR [scrapbook]-14301 was born about Feb 1869 in Pennsylvania, United States. She died 1 on 21 Aug 1869 in Monroeton, Bradford, Pennsylvania, United States. Alvin M. ROBINSON-14268 was born 1 on 14 Mar 1846 in Forkston, Wyoming, Pennsylvania, United States. He died 2 on 20 Aug 1916 in Forkston, Wyoming, Pennsylvania, United States. Alvin married (MRIN:4028) Alice Jane FARR-9224 in 1869 in Wyoming, Pennsylvania, United States. Alvin was counted in a census in 1850 in Forkston, Wyoming, Pennsylvania, United States. He was counted in a census 3 in 1860 in Forkston, Wyoming, Pennsylvania, United States. He resided 4 in 1880 in Forkston, Wyoming, Pennsylvania, United States. He resided 5 in 1900 in Wyoming, Luzerne, Pennsylvania, United States. He resided 6 in 1910 in Wyoming, Luzerne, Pennsylvania, United States. Alice Jane FARR [Parents] [scrapbook]-9224 was born 1, 2 on 22 Jul 1849 in Wyoming, Pennsylvania, United States. She died 3, 4 on 11 Apr 1922 in Wyoming, Luzerne, Pennsylvania, United States. Alice married (MRIN:4028) Alvin M. ROBINSON-14268 in 1869 in Wyoming, Pennsylvania, United States. Alice was counted in a census 5 in 1850 in Forkston, Wyoming, Pennsylvania, United States. She resided 6 in 1900 in Wyoming, Luzerne, Pennsylvania, United States. She resided 7 in 1910 in Wyoming, Luzerne, Pennsylvania, United States. Horace FARR [Parents] [scrapbook]-9225 was born 1 about 1820 in of Corinth, Orange, Vermont, United States. He died 2 on 23 Oct 1877 in Bradford, Orange, Vermont, United States. Horace married (MRIN:4029) Susan GREEN-9494 after 15 Jan 1857 in Vermont, United States. Horace was counted in a census 3 in 1850 in Corinth, Orange, Vermont, United States. He was counted in a census 4 in 1860 in Corinth, Orange, Vermont, United States. Susan GREEN-9494 was born about 1812 in Vermont, United States. She died 1 on 6 Apr 1874 in Bradford, Orange, Vermont, United States. Susan married (MRIN:4029) Horace FARR-9225 after 15 Jan 1857 in Vermont, United States. Daniel CORLISS-9286 was born about 1819 in Vermont, United States. Daniel married 1 (MRIN:4030) Susan FARR-9226 on 3 Mar 1861 in Corinth, Orange, Vermont, United States. 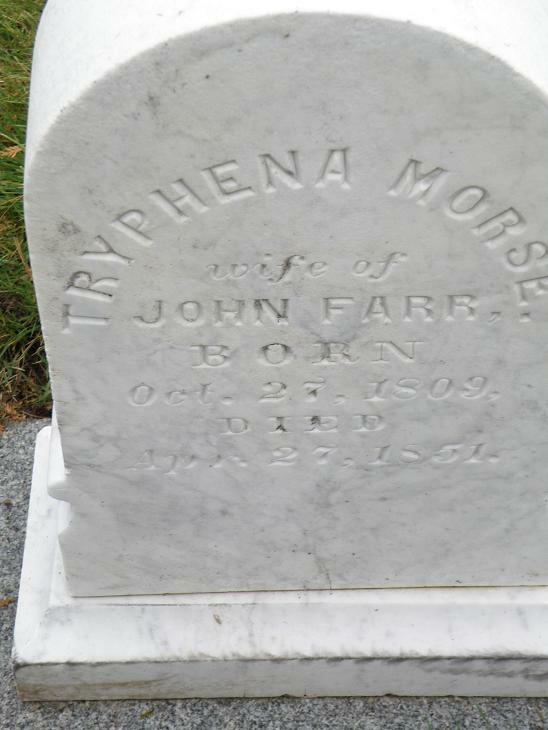 Susan FARR [Parents]-9226 was born 1, 2 on 18 Oct 1825 in of Corinth, Orange, Vermont, United States. Susan married 3 (MRIN:4030) Daniel CORLISS-9286 on 3 Mar 1861 in Corinth, Orange, Vermont, United States. Susan was counted in a census 4 in 1850 in Corinth, Orange, Vermont, United States. She was counted in a census 5 in 1860 in Corinth, Orange, Vermont, United States.